Cable Dawg w/Black Sheath. Designed specifically for communications installation professionals, the Gerber Cable Dawg 30-000399 is loaded with all the tools needed for a job well done. The thoughtful design reduces the bulk and weight of separate tools by supplying spring loaded wire and cable cutters, CAT5 jacket cutter, wire stripper, a locking partially serrated knife, RJ45 crimper, and multiple drivers with a magnetic driver extension in one convenient tool. The handles of the Cable Dawg are glass filled nylon. The handle that houses the driver extension and knife is removable to allow more freedom of motion that truly is comparable to using a stand alone screwdriver or pocketknife. 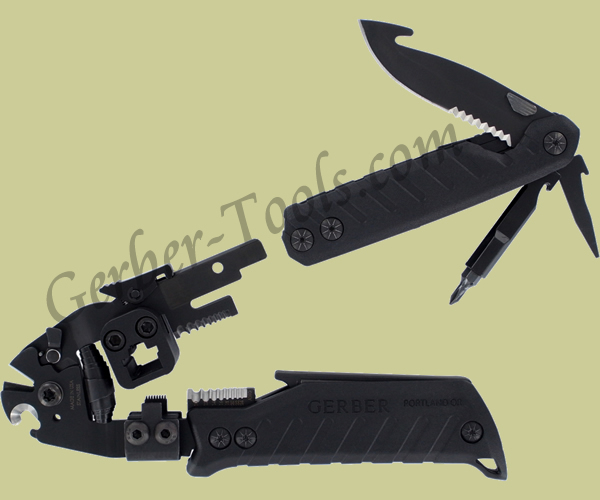 The Gerber Cable Dawg 30-000399 comes complete with a nylon sheath for storing and carrying.